The Caesars Pocono Resorts are located in the Pocono Mountains of Pennsylvania, and consists of four resorts. Three of the resorts are couples only, Cove Haven, Paradise Stream and Pocono Palace. The remaining resort, Brookdale, is a family resort with a nice lake. The resorts are all inclusive with a wide range of suites to choose from. The most elaborate suites have small swimming pools & champagne glass hot tubs in the room. The food was great and the rooms made a very romantic setting. The other nice thing is you stay at one resort and you can visit the other three resorts so you can participate in the activities at each resort. 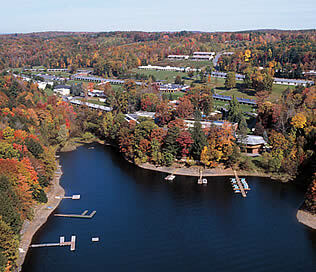 I stayed at the Brookdale resort which had a lake with paddle boats, hiking trails, archery, and many other activities. This area of Pennsylvania is beautiful and close to other attractions outside of the resorts. I would highly recommend the resort; it was a fabulous romantic place.